Then came the hard part. What word could I use. What word can I hang on to this year to help me make 2015 better than 2014. I thought of so many words and started to write. And then it just came to me. I want to SHINE. Shine...yes, shine. verb, shone or shined, shining. I want to take all my highs, all my lows, all my mistakes and learn from them all. From all of that, I believe I can then SHINE. Just like when a glass breaks, through all of it's pieces it still shines when the sunlight hits it. 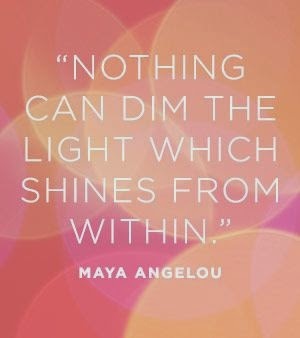 This just reminds me, no matter what, I can SHINE through anything. Last year was a tough year. There was lots of breathing, crying and lots of positive thinking. I want to invite this word into my life, I want to live with this word each day. I want to mediate on this word weekly. I want to help someone else SHINE.